2.00 29, Jan, 2000 First Released. 2.10 2, Feb, 2000 SCO UNIX driver added. 2.40 24, Feb, 2001 Updated WinNT40/Windows2000 Drivers to support Gnutella utility. Updated Win95/Win98/WinME/WinNT40/Windows2000 Drivers to support WebGame PoppIt. Windows XP has a built-in Fast Ethernet 10/100 NIC driver. 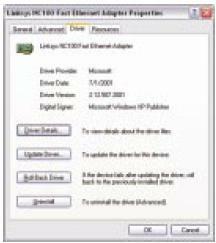 After physically installing the Fast Ethernet 10/100 Network Card into your PC, Windows XP will automatically install the Fast Ethernet 10/100 driver. Power up your PC and start Windows XP. Click Start and Control Panel. Click the Performance and Maintenance icon. Click the System icon. Select the Hardware tab. 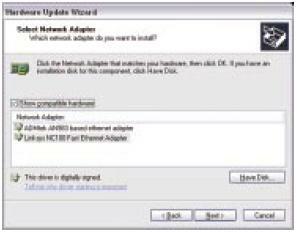 Click Device Manager, and double-click Network adapters. Double-click the Linksys NC100 Fast Ethernet Adapter. Click the Driver tab. 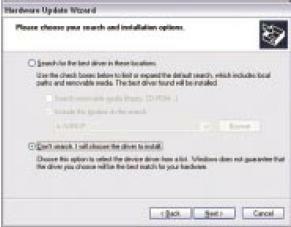 Click the Update Driver... button to update the Linksys NC100 Fast Ethernet Adapter driver. The Hardware Update Wizard screen will appear. Select the radio button next to Install from a list or specific location (Advanced). Click the Next button. Select the radio button next to Dont search. I will choose the driver to install. Click the Next button. The Select Network Adapter screen will appear. If the Show Compatible Hardware is not checked, then select it. Select Linksys NC100 Fast Ethernet Adapter from the list. Click the Next button. When Windows XP tells you that the Hardware Update Wizard has finished installing the driver, click the Finish button to exit. The Windows XP driver installation is complete. 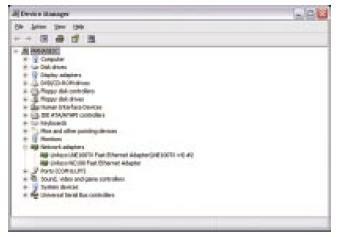 Download Linksys NC100 Fast Ethernet Adapter Driver here.